My senior year of high school, I decided to take AP Calculus. I was taking some other advanced classes as well, and it wasn’t long before my math grade started to lag. Anxious about upcoming college applications and the desire for nothing to mar my GPA, I approached my Calc teacher, Bob Burns, to tell him I should probably drop his class. It was a small school, and between the fact that he had taught several of my previous classes, and that he had coached for a couple of my teams, we had a established a solid relationship. Given that background, I expected that he’d respond to my concerns with reassurance, telling me I shouldn’t do anything to jeopardize my grade and supporting my decision to drop his class. Instead, Mr. Burns declared that if I chose to drop his class that day, I would be setting myself up to drop every other difficult and important thing that arose in my life. Needless to say, I stayed. That was the single most precious skill I gained from his course that year: learning to stay even when the stakes are high. As a tribute to Mr. Burns, I’d like to list other pivotal moments since then when I stayed where I might otherwise have very easily left had it not been for his bold words that day. When I was so homesick my first month of college that I thought there was no way I could live so far from home, I stayed. And earned a teaching degree from a wonderful school. When I was sure there was no way I could continue waking up at 4 am for a custodial shift, I stayed. And was able to navigate the world of college financing. When I felt I simply could not handle my commute and daily goodbyes to my baby girl as I left to teach, I stayed (until bedrest and a couple more babies prompted my current sabbatical). And gained irreplaceable experiences, perspectives, and professional development that would inform all facets of my life, including my current blogging and child-rearing. When I felt I would surely run out of ideas and should give up blogging, I stayed. And have discovered a remarkable PLN that has continued to push my thinking as a teacher. Mr. Burns may not have caused all these events to unfold exactly as they have. But I know that without his bold lesson in persistence, I would have been much less likely to stick around for the hardest, but ultimately, most rewarding aspects of my life. And that is certainly thanks to a teacher. I had not the slightest clue what it meant. Other than a back-to-school lecture, my teacher never referred to it directly (or perhaps she did, but because of the above-mentioned non-comprehension, it probably just didn’t register). Today, I look back at this memory and chuckle at the sheer bafflement I experienced that year. But as a teacher myself now, reflecting on this does provide a bit more than just a laugh. It makes look inward to examine what kind of experience [intended or not] my walls have given my students. In my first classroom, the teacher before me had left behind all sorts of posters on the walls, including posters on 6 traits of writing or motivational quotes. But as the months moved on, I realized that they may as well have been wallpaper for all the benefit my students were getting from them. I did not integrate them in any meaningful way, and eventually, we decided we’d rather make room for student work. Is there a trace of lecture involved? If looking at a quote even faintly makes me wonder, “What’s the deal with kids these days!” (ie, the “common sense is not so common” poster) most likely, a) it’s not going to help my students as much as I think it will and, b) it runs too high a risk of damaging relationships with students. Is it an intentional, interactive display designed to help students see themselves as authentic readers, writers, mathematicians, scientists, etc? This one is a little more abstract, but luckily, I found the perfect example last week on Nerdy Book Club. It’s bookmarked, tweeted, and had better stay in my memory for when I return to the classroom. 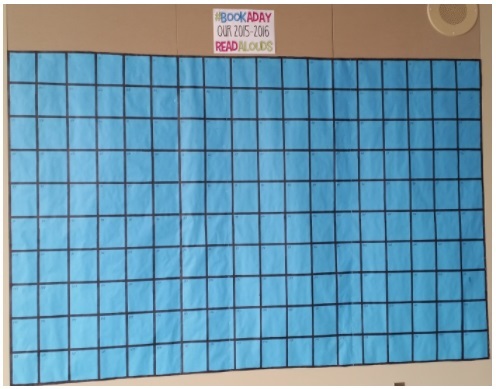 This particular display is meant to share progress on Donalyn Miller’s fabulous #BookADay (also see #ClassroomBookADay) challenge. To me, this isn’t just a bragging-rights kind of display–it’s also a beautiful and handy way to recall individual reads throughout the year that have been meaningful and instructive. Does it bring some rapport-building humor to the mix? 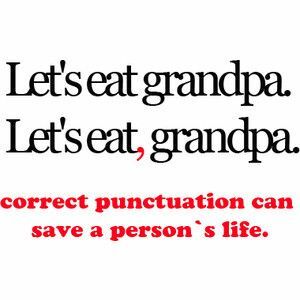 In the middle of a grammar unit? This kind of light-hearted and memorable fun would be a must-share. 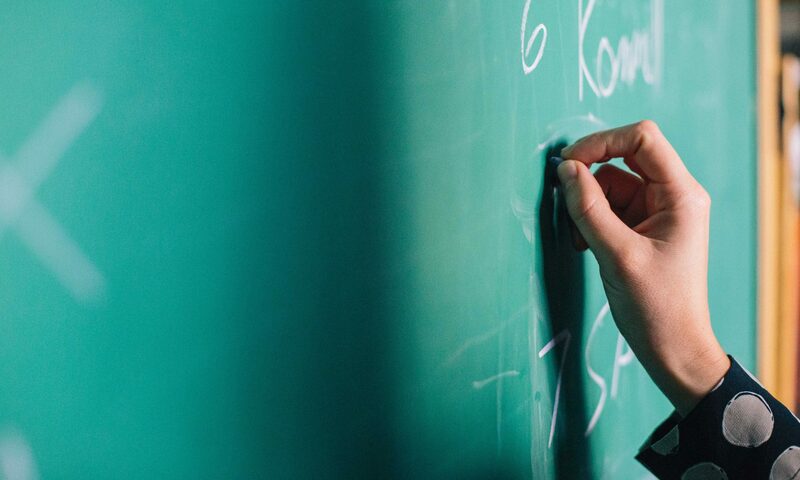 Whatever you display, remember that there’s a reason that the physical classroom environment is called the “third teacher” — decide now what kind of teacher you want it to be! What about you? What are your requirements for what goes on your classroom walls? Please share! My reasoning was that if I kept to a regular routine, I would keep things “covered” and under control. There would be no backup of forgotten chores, because it was already built into my everyday. Seems pretty reasonable, right? I did manage to stick with it — for a few months. But then life happened. My husband’s surgery, another difficult pregnancy, welcoming a newborn — gradually, the cleaning routine fell apart, and I instead had to go with sporadic cleaning according to my limited energy and time. Now, the way I see it, I have two choices: I can look at this as a failure & berate myself into getting back into the groove, OR I can reevaluate my approach & look for learning opportunities and extended applications. I’m going to go ahead with the latter. 1. Arbitrary/Redundant: Attention getting divided up equally among unequal tasks. 2. Limiting: A reverse effect where rather than getting life more in control, we wind up feeling more controlled by the very routines we create. 3. Rigid: Reduced tendency to notice when things aren’t working, or when there’s a better way. 1. Arbitrary/Redundant: Early education programs that devote one whole week to each letter to cover the alphabet, though it’s more logical to dedicate much more time to trickier, high-frequency letters like vowels (and a lot less time to those rarer letters like Q, X, & Z). 2. Limiting: Reluctance for teachers to adopt more student-centered inquiry approaches for fear of deviating from/not covering the plan. None of this is to say that routines don’t have their place. I wouldn’t give up the weekly routine of class meetings any more than I would give up daily tooth-brushing. Furthermore, my original cleaning routine now informs what needs to happen; it’s just more fluid as I evaluate factors such as urgency, whether we’re having house guests, etc. But in the end, we should be wary of any routine we construct that causes our practices to become arbitrary, redundant, limiting, or rigid. The benefits of failure are becoming more and more widely discussed. Perfectionism is getting the boot it deserves. Messy learning is finally gaining the acknowledgement that it’s due. And I’m thrilled! However, I’ve noticed another trend along these lines that’s of a little more concern to me, though it can be tricky to spot. To me, it’s in the form of these signs. Or in the form of comments that take stories like this one & declare that this is how it should be for all children to teach responsibility. Like I’ve said before, there’s nothing inherently wrong with these signs or with this story. In fact, in many circumstances, these are great examples of allowing our children to fail in order to help them grow. What makes this tricky is that allowing our kids to fail does not look the same for all children for all circumstances. But sometimes, we make it look like it is. Which is problematic because then you have parents and teachers who feel like weighing the circumstances is no longer an option–that they must always apply “tough-love” in order to allow their children to learn from failure. And that to do otherwise is an automatic fast-track to entitlement. It’s problematic because it sweeps away the messy process of working one-on-one with a child, leaning more in favor of one-size-fits-all policies. And it’s problematic because it can get us focusing too heavily (sometimes still exclusively) on the behavior aspect of failure. Now, I support and appreciate approaches like Love & Logic. But it’s SO important to remember that relationships are complex and must be approached on an individual basis. What might be the suitable consequence for one child in one context might not be for another. Anything that encourages us to stop listening and start mandating should give us pause.